This is the re-invention of a much more fun and user friendly dunk-tank experience type of game. Kids will not able to get away from this game! 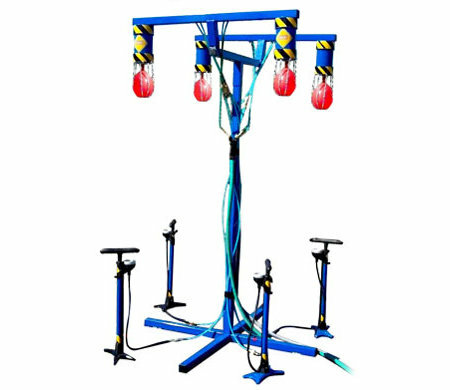 The way it functions is with water balloons and an air-pump connected to a standing/over-hanging metal chamber. It is extremely easy to set up. All it requires is a live water feed to connect to the valve pre-built on the game and regular party balloons. Kids will compete as they’re crouched underneath the over-hanging balloon chamber to race against their opponent and pump as quickly as they can to inflate to the water filled balloon that’s hanging and expanding above their opponents head.